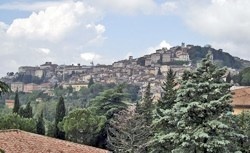 In general terms, each of these suburbs extends from an originally Etruscan gate to a gate in the outer ring of walls that was built mostly in the 14th century. ✴to the Palazzone Necropolis (which includes the Ipogeo dei Volumni) at Ponte San Giovanni. Walk I explores the area around in Piazza IV Novembre. It includes the magnificent Fontana Maggiore (civic fountain), the Duomo and the public palaces of Perugia, as well as the important Galleria Nazionale dell’ Umbria. 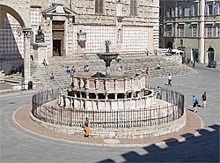 Walk II begins at the Pozzo Etrusco, an Etruscan well at the centre of the city. 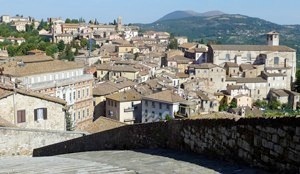 It then follows the line of the main Etruscan street through the city to Arco Etrusco (Arco d' Augusto). This is the first of six gates in the Etruscan walls: these are visited in turn as this walk follows the line of the city walls that enclosed the city until the 14th century. The photograph above shows the two hills that were enclosed by these walls; Colle del Sole on the right retains its ancient stature, but Colle Landone on the left is much lower now than it was in Etruscan times. Walk III begins with a walk along Via dei Priori to Porta Trasimena in the Etruscan walls. It continues through the suburb of Porta Santa Susanna, which grew up around the important church of San Francesco al Prato. Sadly, this ex-church is now only a shell, albeit that it has been magnificently restored. It continues past the building housing a magnificent Roman mosaic and then returns to the city centre along the evocative Via dell’ Acquedotto. Walk IV begins with a walk to the site of Porta Marzia in the Etruscan walls. It then continues along the road to Rome, through the suburb of Porta San Pietro, which grew up around the imposing church of San Domenico. It continues to the Abbazia di san Pietro, which was incorporated into the city’s defensive system in the 15th century. The return leg takes you past the interesting museum in Palazzo della Penna. Walk V begins with a walk to the Arco Etrusco in the Etruscan walls. It continues through the suburb of Porta Sant’ Angelo, which grew up around the church of Sant’ Agostino. This part of the walk ends at Porta Sant’ Angelo itself, which is named for the adjacent ancient church of Sant’ Angelo and which marks the end of the walled suburb. 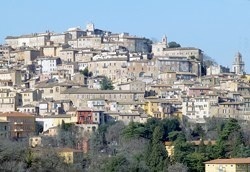 The Franciscan Convent di Monteripido is just beyond it. 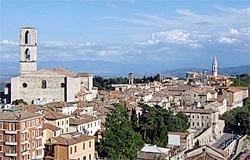 The walk back to the city centre passed the buildings of the University of Perugia in the ex- Convento di Montemorcino Nuovo. Walk VI begins with a short walk to what was probably the site of a gate in the Etruscan walls, at the start of Via Alessi. It then crosses the Rione di Porta Sole, a suburb that began to develop in the 12th century. It passes the closed church of San Simone del Carmine and leaves the wall suburb at what was once the Porta del Carmine. From here, the road runs straight to the interesting church of San Bevignate and the civic cemetery. 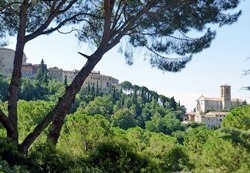 You then retrace your steps towards the city and branch to the right across Monteluce. The church and ex-nunnery of Santa Maria di Monteluce stand at the top. 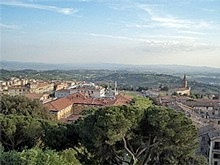 The descent on the other side of the hill leads to the Porta Sant’ Antonio, and continues through this suburb towards the originally Etruscan to Porta del Giglio and back to the city centre. Walk VII begins with a short walk to the site of Rocca Paolina, which was built over the Etruscan walls near Porta Marzia. It explores this area on three levels: the excavated medieval area on which the fortress was built in 1540; the vestiges of the fortress itself; and the urban renewal that followed its demolition in 1860. It then proceeds to the nearby church and ex-nunnery of Santa Giuliana. The return leg follows the outer walls to Porta San Giacomo, and there is a short detour from there to the ancient church of San Prospero. The walk then crosses the suburb of Porta Eburnea to the originally Etruscan gate of that name before returning to the city centre.